One open-ended Research Directors’ Forum was convened on 22 April 2014 as part of the 9th WESTPAC International Scientific Symposium, 22-25 April 2014, Nha Trang, Vietnam. 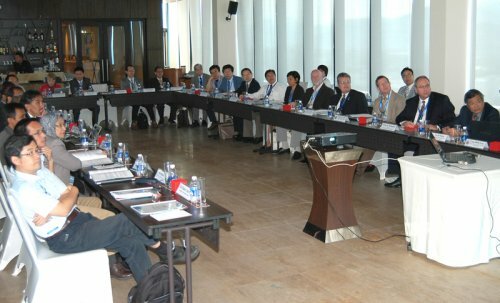 Over 45 Directors, representatives and regional Experts from marine scientific institutes, academic faculties and/or operational agencies in the Indo-Pacific met at the Forum, aiming to build and enhance networks; exchange strategic directions of their institutions; identify scientific and technical challenges; and spark regional actions in the framework of IOC for future collaborations by exploring any opportunity of synergizing existing and planned observations through the emerging Indo-Pacific Ocean Observation Network (IPON). • enhanced efforts in capacity building in developing nations in the Indo-Pacific region, in particular through the development of technical assistance programs and materialization of the “IOC Regional Network of Training and Research Centers on Marine Science”. All participants expressed their appreciation to the IOC/UNESCO for the tremendous efforts, and particularly its WESTPAC, in building the capacity of developing nations, in the Indo-Pacific region for marine research, sustained observations and service underpinning the sustainability of ocean and coastal resources. Mr. Wenxi Zhu, Head of UNESCO/IOC Regional Office for WESTPAC thanked the Institute of Oceanography of the Vietnam Academy of Science and Technology for the gracious hosting and the excellent arrangements that have been provided in Nha Trang.